Issue one was edited by Erin Smith and John Huston and released in 1988. The front cover features a drawing from a coloring book of the character "Samantha" from the television show Bewitched, and the back cover features photos of Calvin Johnson from the band Beat Happening. Inside are articles on The Patty Duke Show; "Cousin Oliver" from The Brady Bunch; the film Ghost in the Invisible Bikini by Don Smith; "Me and My View-Master" by Jeffery Kennedy; and reviews of The Brady Bunch- related songs such as "Sunshine Day" by The Lovedolls, from the film Lovedolls Superstar by Dave Markey (editor of We Got Power), "We Three Bunch" by Adrenalin O.D., and "Jan Brady" by The Lunachicks. 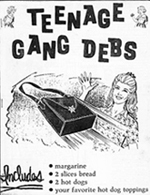 Issue two is edited by Erin Smith and Don Smith, with John Huston and Jeffery Kennedy listed as "friends of Teenage Gang Debs". This release in 1989 solidified the zine's writing style. The cover features a photo of actress Susan Olsen as the character "Cindy" from The Brady Bunch episode "Snow White and the Seven Bradys" on the front cover, with an article on Jan Brady; a Robbie Rist filmography; an interview with the band Redd Kross; an interview with Stanley Livingston; who played "Chip" on the television show My Three Sons; and an interview with the band The Lunachicks. Issue three, released in the 1990 timeframe, features Mike Lookinland from The Brady Bunch on the cover, and interviews with Joseph Barbera of Hanna-Barbera cartoons. Another interview with actor David Garrison, who played "Steve" for the first three seasons in Married With Children, doesn't go so well, but there is a continuation of an indepth interview with Stanley Livingston from issue two; an article on Planet of the Apes, an interview with the band Nation of Ulysses, an article on attending an Annette Funicello concert, and an account of attending tennis camp with Amy Carter by John Huston. Issue four features actor Eve Plumb as "Jan" from The Brady Bunch on the cover and an interview with her inside; a Reader's Poll; an article on the Japanese TV show Ultraman; a photo spread of Maureen McCormick from a teen magazine including a picture of her ice skating class also attended by Susan Olsen; an episode guide to the 1966 TV series Gidget, and fond remembrances of Tic-Tac-Dough, as well as a story of life at the magazine Sassy. Some of the Sassy article information was used in the 2007 book How Sassy Changed My Life. Issue five, the last issue printed, features an interview with actor Robbie Rist ("Cousin Oliver" from the 6th Season of The Brady Bunch). The cover features a photo of Christopher Knight as the character "Peter" from The Brady Bunch on the front cover, includes an article detailing Erin and Don Smith's appearance (with Florence Henderson, Barry Williams, Johnny Whitaker and Charlotte Rae) on The Sally Jessy Raphael Show; "Brush With Greatness" (letters from readers about meetings with semi-famous people); a four page interview with Barry Williams; an account of Robert Reed's funeral service; and a feature on the Scholastic Books 1970's kids magazine DYNAMITE. The rear cover is a reproduction of a page from a Partridge Family coloring book. Issue six was planned for publication in 1994, but was never released and would have featured a continuation of the interview with Robbie Rist and a new interview that took place at a Boredoms show, as well as an in-depth discussion of Bethesda, MD with director John Waters. This page was last modified on 8 June 2011, at 18:36.